Horizon offers custom solar solutions! 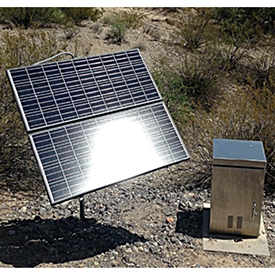 Provide sustainable 12/24VDC or 120VAC power for advanced irrigation controls, lighting, pump operation and more. Accessible through multiple modems, including cellular and WiFi. More flexibility and ease of installation at an affordable price. Power where you need it, when you need it! Horizon will assemble all of the electrical, irrigation/lighting components into a customized enclosure for an easy onsite installation. All solar solutions are engineered to meet the specific needs of your project. For more information contact us at Pat.Johnston@horizononline.com.